Even after several rumors, set leaks, and the many photos director Ron Howard has tweeted, we still no very little about the untitled Han Solo, which is due out next May. Thankfully, our friends over at Making Star Wars are always providing us with new, exciting scoops. Their latest report from MSW's Jason Ward regarding the Han Solo film focuses on one of the most iconic vehicles in the saga, the Millennium Falcon. Specifically, what it might look like and who will be in the pilot's seat. If you don't want to know anything about this film, use caution when reading further. This is your official SPOILER alert. 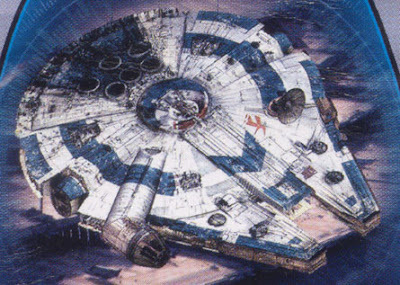 "The Falcon is brand new and owned by Lando in the untitled Han Solo film. It has blue detailing all over it with a white base coat of paint." 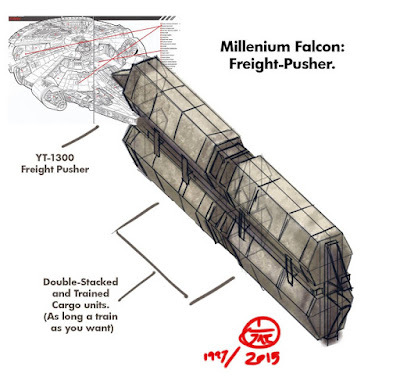 "The other interesting detail is that we finally see the Falcon doing what it is supposed to do with cargo. Basically there’s an attachment that hooks into the front of the ship’s front “forks” and that elongates the front of the ship. It looks seamless but can also detached to drop a shipment of spice if Imperial entanglements get too complicated. The center of the ship allows for access to the cargo." 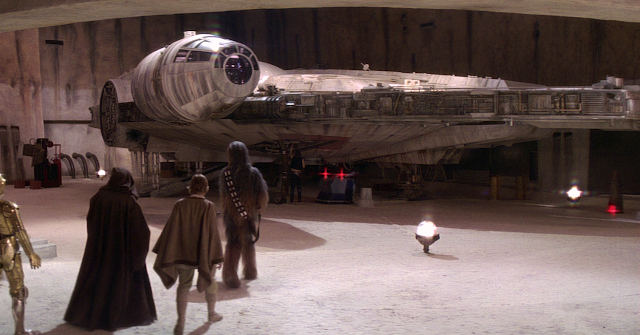 Throughout all of it's appearances in previous Star Wars films, the Falcon has proven to be a character all her own. Considering that this specific Y-1300 Frieghter is such an important part of Han Solo's character, it will be interesting to see what role it will play in this film. As always, this is just a rumor until officially confirmed by Lucasfilm. The untitled Han Solo opens on May 25th, 2018 and stars Alden Ehrenreich (Hail Caesar!) as Han Solo, Donald Glover (Atlanta) as Lando Calrissian, Emilia Clarke (Game of Thrones) as Kura, Woody Harrelson (True Detective) as Beckett, Phoebe Waller-Bridge (Fleabag), Thandie Newton (Westworld), and Joonas Suotamo (The Force Awakens) as Chewbacca. The film is directed by Ron Howard (A Beautiful Mind), with a script by Lawrence Kasdan (The Empire Strikes Back) and his son Jon Kasdan (The First Time). Why is the Falcon now new? It used to have previous owners before Lando & was far from new when he owned it.